Here you are with a lovely new journal. Maybe you’ve decorated the cover, or done a ritual to honor your materials. Now it’s time to start putting something on the pages—aaak! Some demons lurk here. Even with many years of experience, I sometimes get hung up on feeling I’m not going to be able to create something worthy of a lovely new journal. You might think it’s a beginner thing, but trust me, it happens to all of us. Worry #1: What if I make a mistake? Okay, maybe that’s too much to ask. How about just finish swearing, take a deep breath and don’t give up? But honestly, mistakes are creative gold! I have to constantly remind myself that creativity is born from “mistakes”. In art-making or problem-solving, a “mistake” is what we call something we didn’t consciously intend and aren’t sure we like. But the unexpected is what forces us to think creatively, instead of just recycling old ideas. It helps me to think of all of my creative work as a conversation. In a crayon conversation, your partner may do something unexpected. Instead of freaking out, you simply pause, shift your thinking a bit, and maybe choose a different color. But, I don’t. Mostly because I know how silly I’ll look if I shriek and run away from a conversation because someone raised a point I hadn’t thought of before. When I find myself tempted to stop because I made a “mistake”, the mental image of myself shrieking and running from my journal over a wobbly line or a misspelled word is usually enough for me to regain a little perspective, chuckle at my overreaction and move on. If that doesn’t work, I remind myself that closing my journal every time I don’t like what’s happening on the page is like slapping the person I’m talking with every time they say something I didn’t expect to hear. Not much of a conversation. Worry #2. I can’t start I until I know exactly where I’m going (and have a detailed plan for getting there). If you’re making a Batman costume or a lemon pound cake, sure. When you start a crayon conversation (or a spoken one, for that matter), do you remain silent until you know how the whole conversation will unfold? If you’re catching up with a friend, you usually have some things you want to share, and you’re eager to hear their news. Sometimes, they wind up telling you something sad or shocking or scary, and then the conversation takes a quite different turn than you’d expected. But you don’t avoid conversations with your friends because they might say something unexpected. Those conversations are the really important ones! Try taking the same attitude toward your journal. Go ahead and start a page with just a general idea, and then follow the conversation from there. Begin by simply placing some color, shape, and lines on the page. Sometimes the best thing you can do is get anything at all down on the page. Imagination is visual (Same root as “image”, after all.). Sometimes you can’t decide what you think about something until you actually see it on the page. If it’s not what you had in mind, see worry #1. Remember, this page might turn out to be the seed of something else on another day. Maybe the work you need to do today actually starts with another page that you stopped working on two weeks ago because you didn’t know then where it was going. Creative work often develops gradually over time. That “Aha!” moment is only the culmination. First, we have to lay the groundwork that leads to the flash of insight. The trouble is, we don’t know exactly what groundwork that is. Or maybe that’s the gift, not the trouble. Maybe we can just focus on laying lots of groundwork and let the insights take care of themselves. Worry #3: I have so many unfinished pages! I need to finish some of the ones I’ve been working on before I start something new. For those of you feeling guilty over closets full of unfinished creative projects, I have good news! You are supposed to have lots of “unfinished” pages in your Creative Energy Journal. An unfinished page means today you don’t have to start from that scary ol’ blank page. Unfinished pages are the clouds in the sky of your imagination. It’s much easier to see things in cloud shapes than in a blank blue sky! In fact, in a few days, I’ll be posting about Creative Seeds. These are pages we’ll deliberately leave unfinished, maybe even barely begun. Pages where you simply put down some sort of color, line, shape, words . . . a jumping off point for your imagination on another day. The more Creative Seeds you have in your journal, the more likely you’ll have something that turns out to be perfect for the activity you’re working on today. 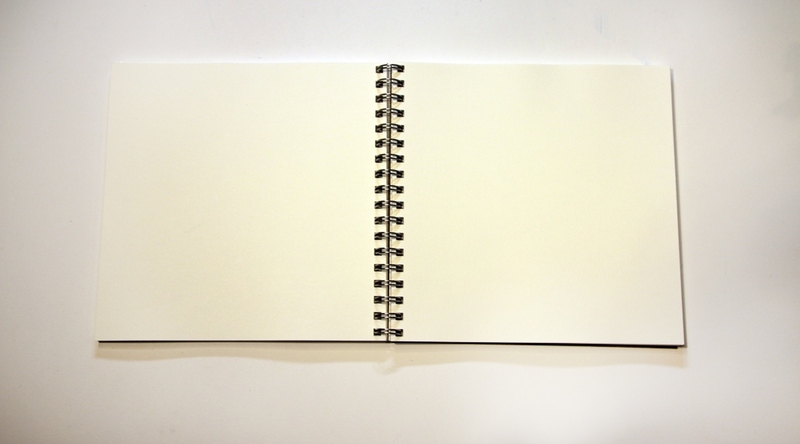 Please don’t make it a goal to “complete” a page each time you work in your journal. You may work on a page many times before you feel it is “complete,” or it may forever remain an open project. Some days you may only embellish a previous page with a few lines. Or, it might be exactly the right start for an activity where you were stuck. Do you always have to “complete” a conversation with your spouse or a friend? You bring things to a pause because someone’s headed off to work, or it’s time for bed, but the next day you might pick up some of the same topics and talk them over again. You can have a similar relationship with your journal pages. You may one day revisit a page you thought was “finished” and find that, because you are now in different circumstances, it’s now the perfect place to begin on a new work. Or decide it needs to be embellished to reflect changes in your life or yourself. Or that you are ready to completely transform it. Tiny new shoots in your garden in spring look nothing like the mature plants, heavy with beans and squash and peppers. Give your journal pages time to mature and grow into meaning. Worry #4: What if one of those unfinished pages bugs me so much that it makes me want to put my journal down every time I see it? I could be glib and say that’s probably a page that has a lot to teach you and you should reflect on why it bugs you. Maybe. That’s your call. And in later posts, I will describe activities you can do with pages that bug you. But sometimes, there’s no deep meaning. Maybe you decided to have a crayon conversation with someone who didn’t get it and just made a big mess to annoy you. Or maybe you got the paper too wet and the page is starting to fall apart. Or maybe you used something that won’t dry completely and the page is sticking to nearby pages. You may be able to resurrect the working surface by painting over it with with opaque paint, or gluing another piece of paper on top. In later posts, I’ll share some ways to radically transform pages. Transforming a page can be a great way to consciously put something in the past, or celebrate a new direction. But, if a page is really bugging you today, don’t drive yourself nuts. Take that page outta there! If that page is standing in the way of using your journal, give yourself permission to get that obstacle out of your way. You are in charge here, not a stack of paper! Worry #5 : What if someone sees this page and makes fun of it or misunderstands and gets hurt? I want to feel entirely free when I’m working in my journal. I don’t want to censor myself or start worrying about whether someone else will like it or get it. I don’t want to get caught up in making something to impress someone else. This is why I have a rule not to share my Creative Energy Journal with anyone. I do sometimes share a photo of a page, and I sometimes use some of the same techniques in sketchbooks I do share, but I just don’t share my Creative Energy Journal. Ever. What you do with yours is your call, but if Worry #5 is one of your worries, I encourage you to adopt the same rule. This sometimes takes a firm approach. People get all excited when they see art supplies. People who would never think of leafing through your diary somehow think something that looks more like a sketchbook is fair game. You may have to explain otherwise. If they ask to see what I’m doing, I simply say, “Sorry, this isn’t a sketchbook; it’s my private journal.” Deciding ahead of time what you will say makes things a LOT easier. Most of the time you won’t have to say a thing, but knowing that you won’t be caught off guard will help you relax about the whole thing. If people are curious about what sorts of things you do in your journal, point them to my blog. They can see examples online, instead of looking through your personal journal. I will be posting activities that involve reflecting on, and maybe writing about, how characters in a story or images on the page represent people in your life or aspects of yourself. Just as with a written journal, you’ll have to make your own decision about whether you are comfortable having that material in your journal. If you live with someone who can’t resist snooping and you find yourself constrained by worries that they’ll find your work and be upset, you might choose to do those activities on a separate sheet of paper. For most of us, though, the worry that someone will see our work and laugh is unfounded. I suggest you not share your journal because I think it’s best not to be imagining the reactions of others while you are trying to work, not because I think someone is going to laugh at it. If you want to share, share a single page or better yet, a photo. But consider not letting others look over your shoulder or browse through your journal. No one else’s opinion matters in your Creative Energy Journal but yours. Keeping it for your eyes only helps you work freely and from the heart.